Laura, wife of Jasper Newton Wilson, was born December 8, 1846 in Camden County, Georgia. She was the daughter of Peter W. Guinn and Rebecca Tucker Guinn. She died May 27, 1919 in Cadallic, Alachua County, Florida. L to R Allie Lee Wilson B. July 21, 1888 in Cadallic, Alachua County, Florida, youngest daughter of Jasper Newton and Laura Wilson. Allie married Jasper H. Davis, February 6, 1910 and her mother, Laura Strobar Guinn Wilson. Picture taken in 1935. Leona Bell Wilson B. June 13, 1877 in Cadallic, Alachua County, Florida. Leona married Isaac Tucker Wainwright, August 1, 1895. Leona daughter of Jasper Newton and Laura Wilson. L to R. Allie Lee Wilson and her sister Daisy B. Wilson B. January 4, 1884, in Cadallic, Alachua County, Florida. Daisy married William Oneta Russell, April 23, 1905 in Alachua, Alachua County, Florida. Daughters of Jasper Newton and Laura Wilson. Picture taken Abt. 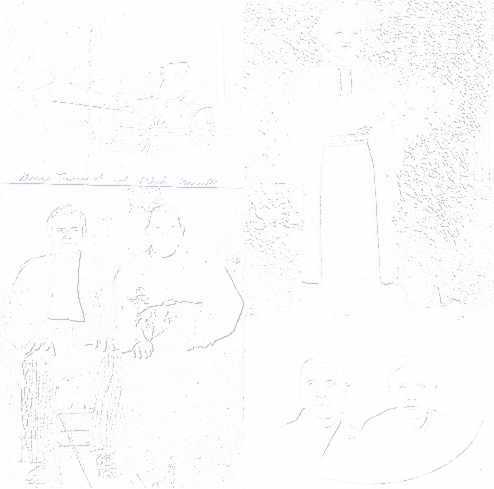 late 1912 - early 1913 L to R John Newton Wilson, Father, George Washington Wilson in front of George, Aubrey Bishop Wilson, Mother, Alice Jane Rawls Wilson baby in arms, Laura Strobar Wilson and Lula Alice Wilson. Taken late 1912- early 1913 - Four oldest children of George and Alice Wilson. Back row L to R - John Newton Wilson, Lula Alice Wilson, in front L to R - Aubrey Bishop Wilson and Laura Strobar Wilson. Taken September, 1946 George Washington Wilson, son of Jasper Newton and Laura Strobar Wilson, Alice Jane Rawls Wilson, daughter of John Green and Janie Burnett Rawls. Both buried in Forest Grove Baptist Cemetery. Back Row L to R Ernest Leroy Wilson, Lula Alice Wilson Clark, James Woodrow Wilson, Jesse Gracy Wilson, Aubrey Bishop Wilson, John Newton Wilson, Laura Strobar Wilson Barber, & Arthur Julian Wilson. Willie Tyson Wilson, B. February 3, 1871, Cadallic, Alachua County, Florida, son of Jasper Newton and Laura Wilson, D. February 5, 1955, Alachua, Alachua County, Florida, buried in the Cathcart Cemetery near Alachua, Alachua County, Florida. Taken in Waldo, Alachua County, Florida. 620 E. Main Street South. The home was divided in to apartments and later demolished to make way for the parking lot of Sun Bank on N. E. First Street. Willie Adams Stringfellow was born June 13, 1875 at Opalaka, Alabama. Her parents were Robert Toombs Adams and Dorothy (Dolly) Caroline Boyd Adams. Her two brothers were John Houston Adams 1878 - 1917 and Robert (Bob) Toombs Adams Jr.
Front row: William Henry Glass, Theresa Louise Glass, Camillus Coxe Glass, Lillian Yetive Glass, Robert Emmett Glass. Back row: Lucille Sue Glass, Arthur Martin Glass. The photo was taken about 1912, two years before the death of Arthur Lorenzo Glass. The home was at 610 E. Church Street in Gainesville, FL. The three girls in the photo are Tessie, Kathleen and Lillian. The three girls in the photo are Tessie, Kathleen and Lillian. Gainesville 1901 Left to Right standing: Aunt Annie Jordan (only sister of Graham brothers), Uncle Wright Jordan, Aunt Victoria (wife of Dodd Graham), Uncle George Graham, Uncle Frank Graham, Aunt Molly (wife of Frank Graham). Stella Anna DeSha is the woman on the bench, front right, hands in lap, looking down. Nice BIG plant, eh? She looks to be 16-22-ish and was born in 1891, so abt. 1906+ Could be church or school. Don't know why she has leaves in her hair. Stella Anna DeSha is second to last second row right with dotted blouse and watch pinned to her right front. She looks as if in her early 20's. She taught school only 1 year at the Orange Heights School which this is. Sometime between 1908-1915???? Looks like a Church (Waldo, if so) or School?? picnic. Stella Anna DeSha has pointed herself out there. Seems to be the same occasion as Gathering photo above. Stella is wearing the same outfit and still has leaves in her hair. She is standing roughly in the second row, just right of the center picture, has her arms behind her back and leaves. Photo of Joseph Finegan DeSha Farm #1 at Hatchett Creek, NW corner of S22 T09 R21 in Alachua County, Florida. Picture taken about 1895-96. L-R are Mae Eady DeSha and doll, unknown girl and doll, unknown woman, Harriet Mariah Beasley DeSha, behind Bernice Ella DeSha, Lawrence "Lonnie" Madison DeSha, Joseph Finegan DeSha, and Stella Anna Desha with doll. Eliza Anna Parrish DeSha (1835-1918), daughter of Ezekiel and Mariah Faye Parrish, wife of Franklin DeSha (abt 1826-1867). This was her home on one of Waldo's two "main" streets. Mae Eady DeSha (1890-1984), sister of Stella Anna DeSha (Thomas) and Bernice Ella Desha (Blackburn); oldest daughter of Joseph Finegan DeSha and Harriet Mariah Beasley DeSha. Sugar cane tasting? L-R: Bernice Ella DeSha, Joseph Fenigan DeSha ?, Harriet Mariah Beasley DeSha, Stella Anna DeSha, Mae Eady DeSha Stevens, Arthur Lawrence Stevens. Unknown man in back row. Post 1912? Bettee V. DeSha says in her history of Waldo, entitled East Side of Eden, that the house in this picture was built by my GG Grandfather, Franklin DeSha (1826-18, the first in-Florida DeSha whose land grant was out on Lake Alto. Picture taken in Alachua County. Hazel is a descendant of Hettie Thomas and Asbury Goolsby. Second wife of Roland Thomas. Eliza was the daughter of Lillie Townsend and William D. Kelly. Photo taken around 1918 in Alachua County. Picture is taken around 1915 in Alachua County. John Raymond Light was the son of Lillie Townsend and William D. Kelly. Picture taken in Gilchrist County. Lillie was the wife of William D Kelly and daughter of John Light Townsend and Indiana Nancy Florence Sikes. Picture taken around 1880-1890. Henry H was one of the first settlers in Gainesville. He was a highly honored journalist who owned and edited a few first Gainesvillle newspapers. One of the newspapers was "The Advocate". George Stuart came to Alachua County before 1870 from Newberry County, SC. George owned a grocery store on the square in Gainesville . His son Harry McCreary became a early Gainesville physician and was a prominent Gainesville physician for over 33 years. Picture taken around 1910 in Alachua County. Ada was the daughter of Roland Thomas and Mary Ann Carver. Minnie was the daughter of Roland Thomas and Mary Ann Carver. Taken in early 1900's in Alachua County. Picture taken in early 1900's in Alachua County. Pictured are children of Roland Thomas and Mary Ann Carver. Picture taken around 1915 in Alachua County. Timothy was the son of Roland Thomas and Mary Ann Carver. I have no info on this one except its Ethel GORNTO and George TOWNSEND - picture type tells me its probably late 1800's maybe bit earlier. Picture taken in early 1900s in Alachua County. Lela Malinda was the daughter of Henry Franklin Townsend and Maria May. Frank Townsend was the son of Stephen Townsend and Sabrina Robinson. Picture taken in Alachua County about 1920. Simeon Lyte was the son of John Light Townsend and Indiana Nancy Florence Sikes. Laura Louise Standley & her first husband Charles Edward Speight. She was born in Mikesville Fl. July 4, 1873. She was the daughter of James W. Standley and Eliza Livonia Townsend. She was born in Mikesville Fl. July 4, 1873. She died in Gainesville, Fl. July 4 , 1959 and is burried in Hague Cemetery. She was the daughter of James W. Standley and Eliza Livonia Townsend. Born Alachua Co. February 14, 1872. Died January 8, 1938 Alachua Co. Burried in Hague Cemeter. He was the second husband of Laura Louise Standley Speight. Born April 2, 1842 in Florida. Died March 2, 1915 in Hague Fl. She is burried in Hague Cemetery. She was the wife of James W. Standley. She married second Thomas C. Hunter. She was born in Mikesville Fl. July 4, 1873. She died in Gainesville, Fl. July 24, 1959 and is burried in Hague Cemetery. She was the daughter of James W. Standley and Eliza Livonia Townsend. Born 1842 in Alachua Co. Fl. Died December 25, 1879 in Alachua Co., Fl. He was the son of John B. Standley II and Penelope Laura Barrow. James W. Standley married Eliza Livonia Townsend. James Henry Standley born March 14, 1878 in Hague, Fl. He died December 1956 in Jacksonville, Fl. He was the son of James W. Standley and Eliza Livonia Townsend. Hague Methodist Church. About 1880. Hague, Fl. James Gordon Hunter, born 1874. Son of Thomas C. Hunter and Lenora Townsend. James Henry Standley born March 14, 1878. Died December 1956. Married Annie Antoinette Rodgers. He was the son of James W. Standley and Eliza Livonia Townsend. Eliza Livonia Townsend born April 2, 1842 (on left) and her sister Lenora A. Townsend (right) born June 1847. Sally Harnage Kelly, Delores Mongovie, John Nathaniel Kelly & Swinton Kelly. Starting on the left is Sabra Clementine, second wife of John W. Harris. She is holding Susan Emily Harris. Next is Florence C. Harris Cannon, holding Willie Cannon, and her husband Lewis Cannon. This is a picture taken in 1906 of Aaron James Higginbotham with his 3 grandchildren: John, Joseph and Leona Hogan. Aaron was born September 27, 1832 in Spring Grove at Hogtown in Alachua Co. and died April 3, 1910 in Williston, Levy Co.
Samuel Joseph Russell, son of Samuel Russell and Mary Caroline Tison. He was born in Newnannsville August 2, 1852, and died in Columbia Co., February 3, 1934. George Beauregaurd Cellon was the son of Missanariah Sparkman Cellon and John Alexander Cellon. Uncle George was a renown botanist known for propigating the mango and the avocado. Mae Cellon Bryan and her son Adrian Bryan about 1919. Mae is the daughter of Frank (Buddy) and Jane Polk Cellon. 1900-1922 Mae Cellon Bryan was my great aunt, she married W.D. Bryan in 1917 and bore 3 children. Adrian, born in 1918. Robert Adair, born in 1920, was killed in a bicycle accident in Columbia County in 1935. Margery who was born in 1921. GHS football team early 1920's. A cousin, Mondell Cellon, is 2nd from the right on the bottom row. This is a picture of Frank, Marvin, Ruby and Jane Cellon about 1917 in front of their home in Millard Station. It's on Archer Road about 1/2 mile west of Shands. B.W. married my great-great aunt, Utah Polk. They had a farm in NW Alachua County. Truman Cellon was born in Alachua County in 1902 and was killed in Ft Myers in 1925. This is a picture of him taken in South Florida not long before he died. This is Ruby's senior picture from Gainesville High School, class of 1922. A boyfriend of hers urged her not to wear her spit curl for her this picture. He told her one day it would look so dated. Ruby and Marvin Cellon about 1918 behind an early billboard for the "White House"
Maggie was born 24 November 1878. She died 11 April 1970. She married Allen Lumpkins and had 4 children, Aaron, Maggie, Rena & Ellen. Her father was John Rawls and her mother was Caroline Hathcock. We believe this photo is of 3 of the children of Maggie & Allen Lumpkins. This would be Aaron and the twins Rena & Maggie. We believe this is Aaron Lumpkins. He was a cook. Orian, the one holding the gun, was the son of Ellen Lumpkins (daughter of Maggie Lumpkins) and Bingham Welch. He was born 14 July 1914 and died 27 February 1963. We believe this to be John Rawls, father of Maggie Lumpkins. This might be Cesar Lumpkins father of Allen Lumpkins born 1837.